Welcome to Just Tyres Strood. You won't be under any pressure to buy shock absorbers or brakes because we don't sell them! We only supply and fit car, 4x4 and van tyres. This means we offer you expert knowledge and a wide choice of tyre brands. 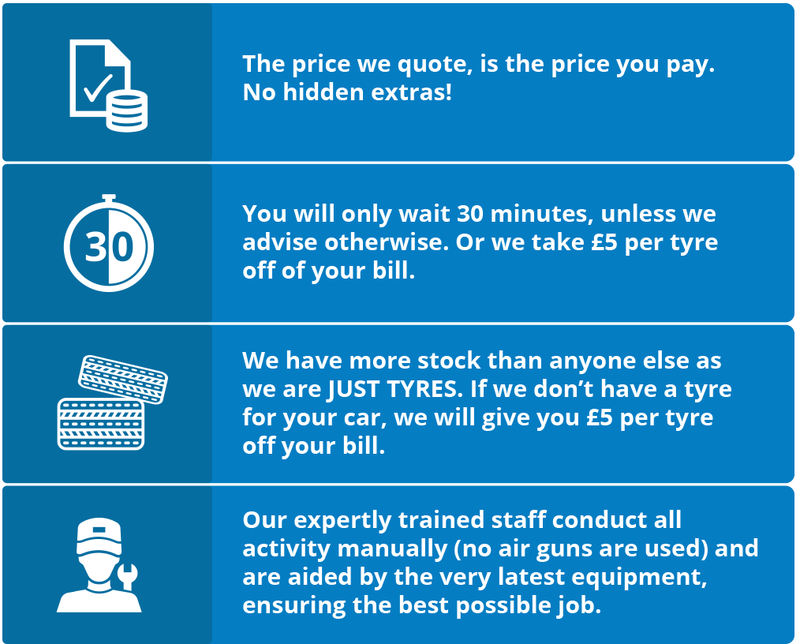 Just Tyres Strood provides a wide range of products at competitive prices, and we can refund the difference on any tyre purchased within a 20-mile radius of our Strood fitting centre. You just need to bring us a written quote on the price within 7 days of the initial purchase, while online quotes are not accepted. Our team is trained to fit tyres safely and we never use airguns to tighten wheel nuts, instead we tighten and torque wheel nuts by hand, so they're never over tightened and problematic in the event of an emergency. Every tyre we install is correctly seated on the wheel and we do this by over inflating the tyre before deflating it to the correct pressure. The Strood tyre fitting centre is on Knight Road with easy access and good facilities. If you need tyres and are based in Strood or the surrounding area, why not pay us a visit. Don't forget you can also pop in for a FREE Tyre Check where we can offer advice and assistance on any tyre queries you may have . If you would like to buy your tyres online and have them fitted at our tyre fitting centre in Strood, just click on the Buy Online image and book your fitting day and time during checkout.